This was breakfast last Saturday. My favourite. We were supposed to go to McDonald's for a family breakfast but we had to give it a miss as I wasn't feeling well. Sometimes, during weekends, we go to McDonald's for breakfast because Sayf likes going there just for the sake of eating in the McDonald's restaurant which he called in his cute three words "Mad-Dog-Nald". I hope the McDonalds are not very mad! Hehe! ;p Sayf is still working on his phonics skills. I like going to McDonald's for the big breakfast. 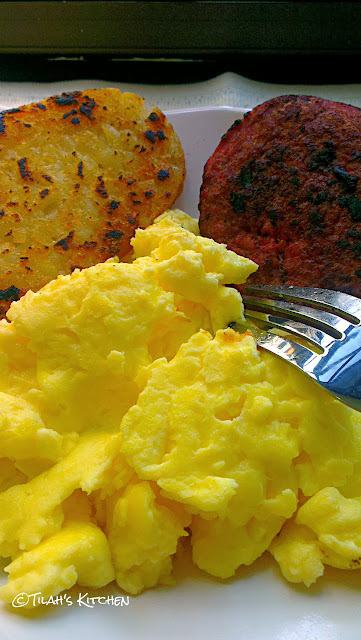 I love the big breakfast mainly because of the scrambled eggs. 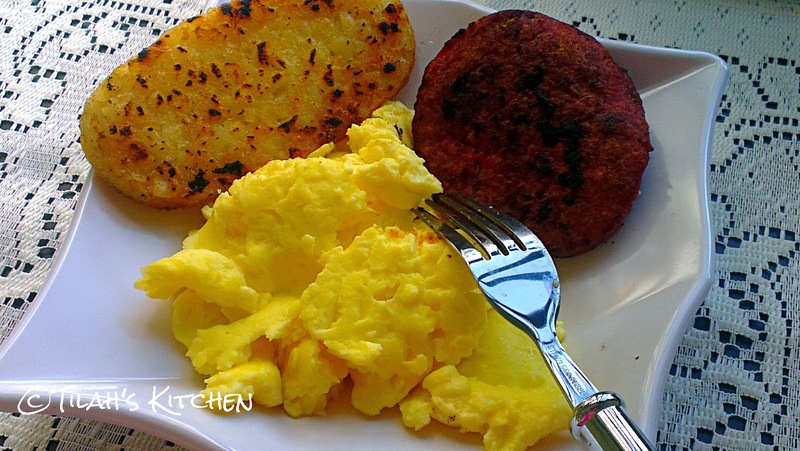 I will always pay more so that I can ask for a special order of an extra serving of scrambled eggs in my big breakfast. After eating big breakfast, I will start praying very hard in my heart for a "small Tilah". Hehe... i know it's dumb, but I will never stop my wishful thinking. 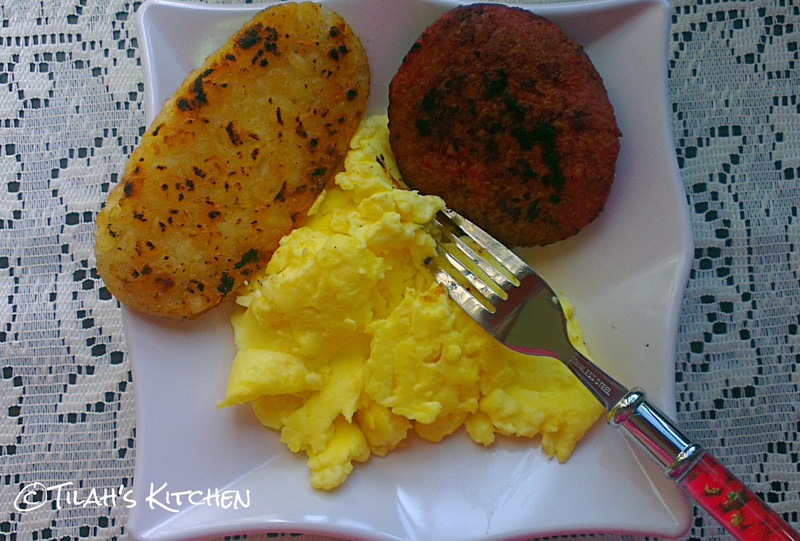 My hubby is cool with anything for breakfast so long as it is edible. Looked through the freezer and there is still another box of hashbrowns which we always keep in stock for Sayf. I also have some beef burger patties. I then decided to grill the hashbrowns and beef patties in my Happy Call double sided pan, toast some bread and whip up some scrambled eggs. 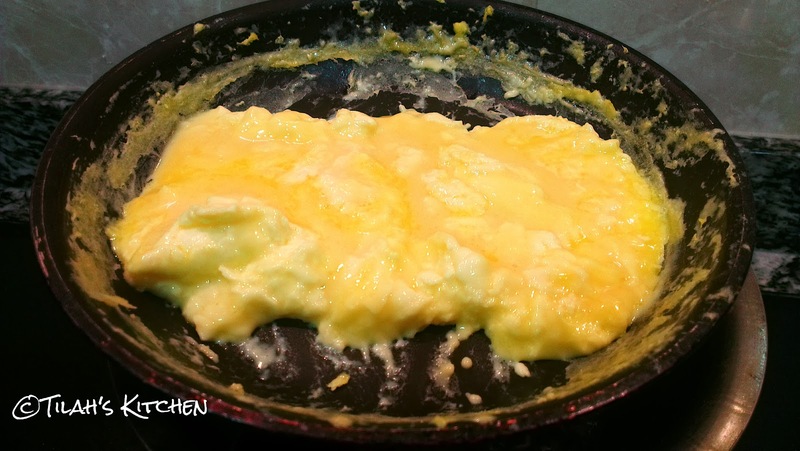 One way that I don't like cooking scrambled eggs is having my pan over fire. Reason being that I find my eggs get overdone. Maybe I am just not skilled :) especially when I have three boys (the husband included) fighting for my attention in the morning. However before anything else, let me remind you that I am not a professional chef. 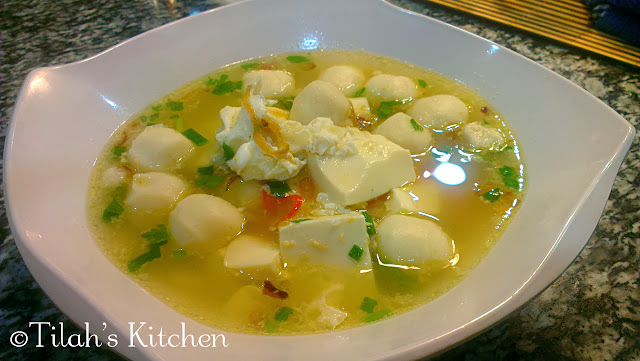 I am just a normal cook like most of us out there cooking and doing our daily stuff with trial and error and sometimes with some raw details. I am learning every day! 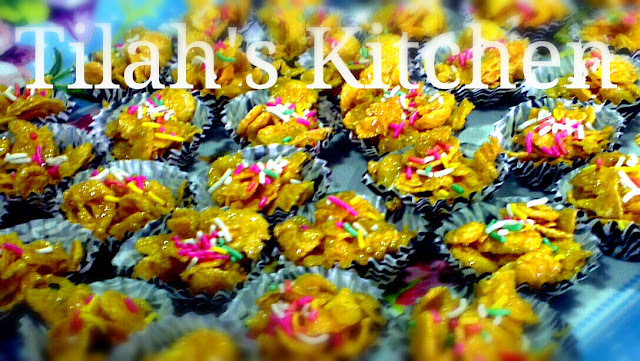 The most beautiful part of it all, is that I get to and I want to share about cooking. There are just so many ways to cook everything! We can all learn from each other. 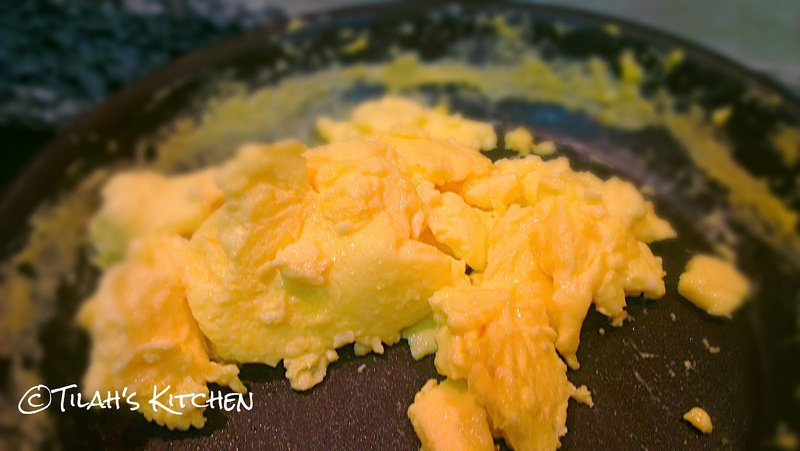 If one thing needs to be perfect for my tongue however, it is scrambled eggs. 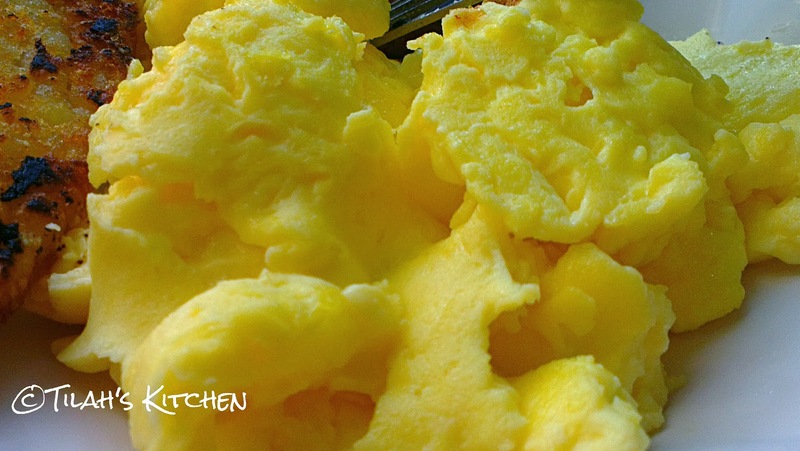 Just like the McDonald's scrambled eggs. 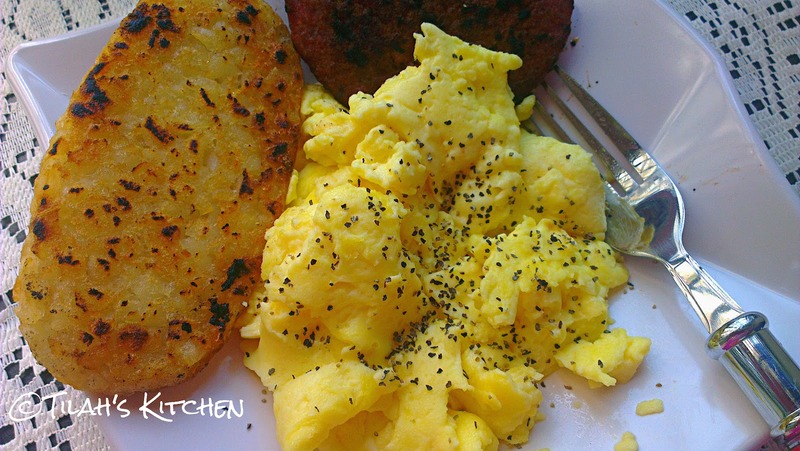 My big breakfast scrambled eggs. Moist but not wet. Fluffy and soft and I can taste the milk and the egg and the butter all in one bite. 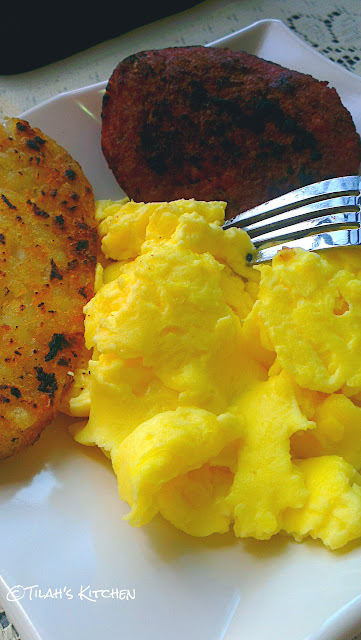 Well, I don't know what McDonald's put in their scrambled eggs other than eggs but it sure taste like that. So good you can even eat it on it's own! Now I sound like Gardenia's bread advertisement! Going back to my egg story, after having a few overdone scrambled eggs session over the fire, I decided to put my pan on the top of a pot of boiling water. Then I got the taste and texture just the way I like it and just right for my taste bud. 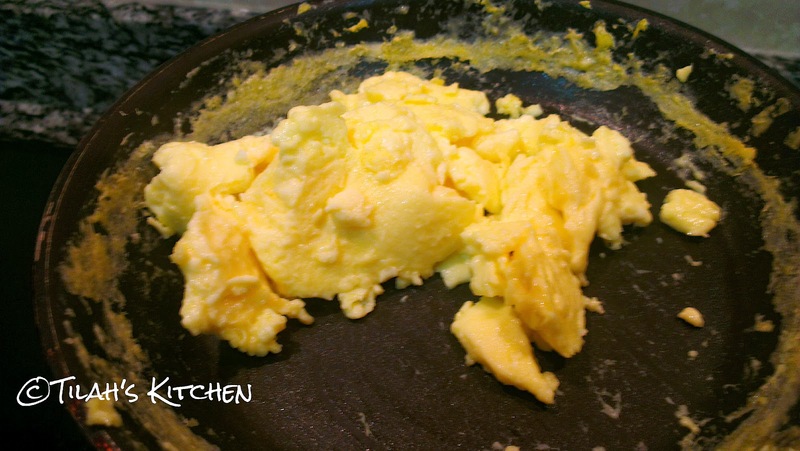 I never put my pan over fire when I am making scrambled eggs ever since. 1. 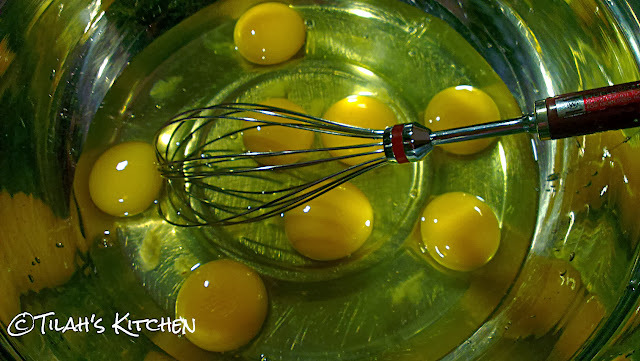 Break eggs in mixing bowl. 2. 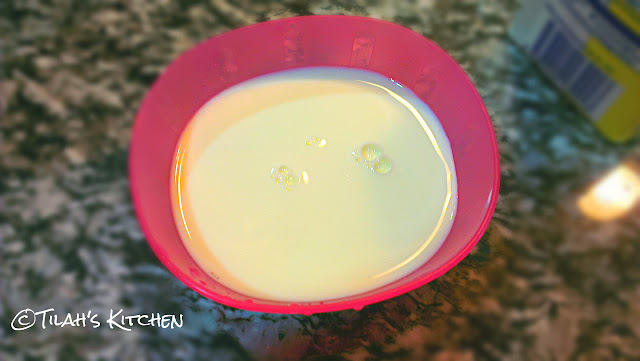 Also add the 1/2 bowl of fresh milk together with the eggs into the mixing bowl. 4. 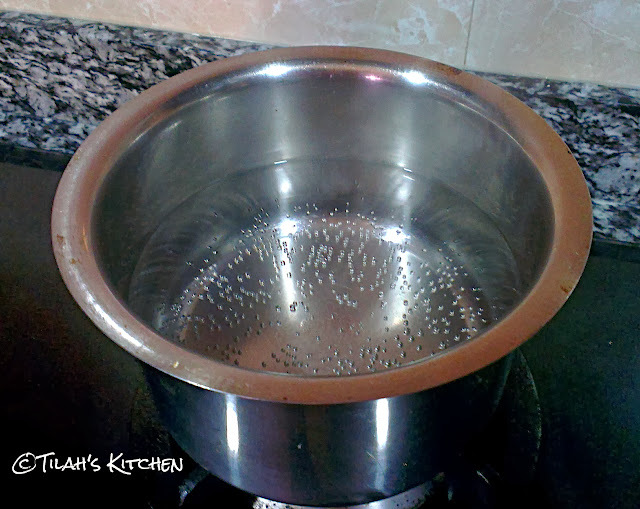 Meanwhile boil some water in a pot. 6. 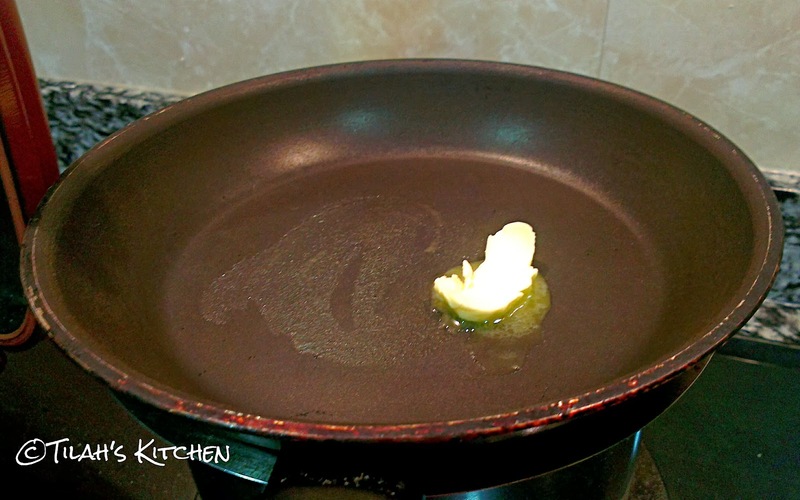 Place a non-stick pan or skillet with a big enough base to cover the opening of the pot and wait for a minute. 7. 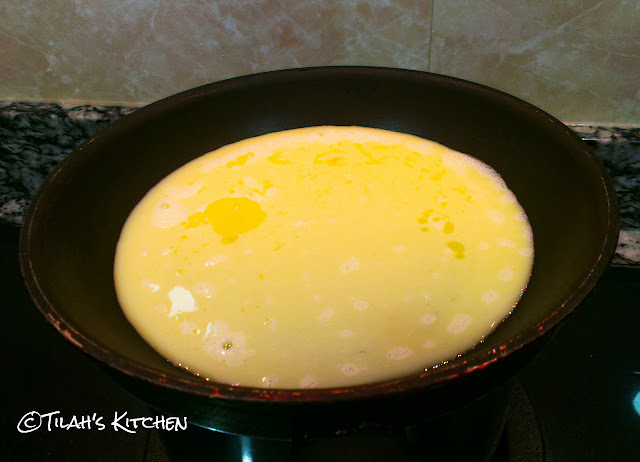 If you did not add butter in your egg mix, you can take a little bit of the butter or all of it if your pan is THAT BIG and let it melt over the pan. 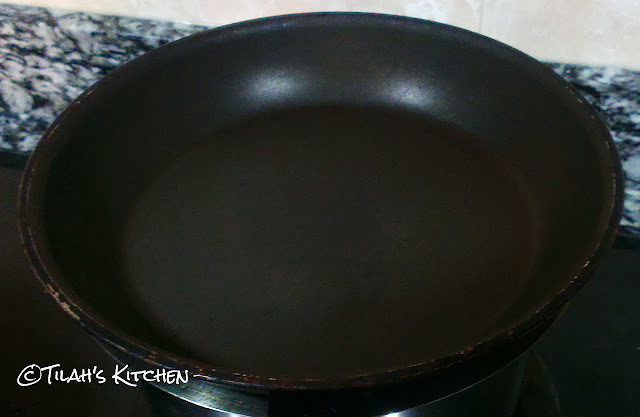 I had to cook my eggs in batches cos my pan is a cute one. 8. 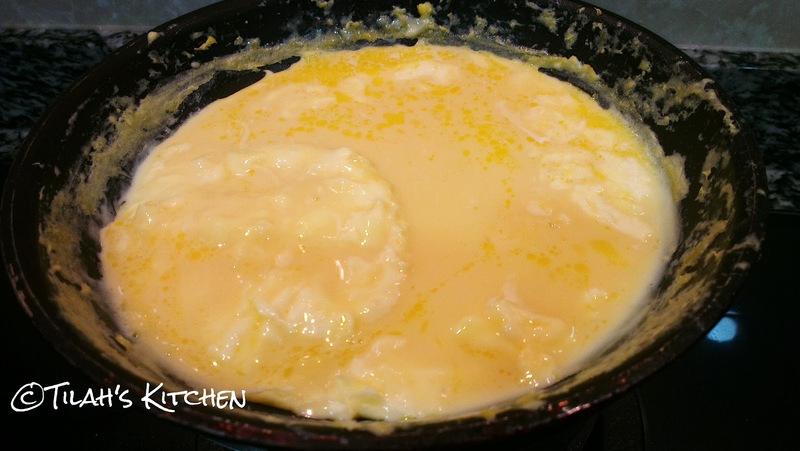 Once the butter has melted, pour just enough egg mix as required. 9. Wait for a few seconds. 10. 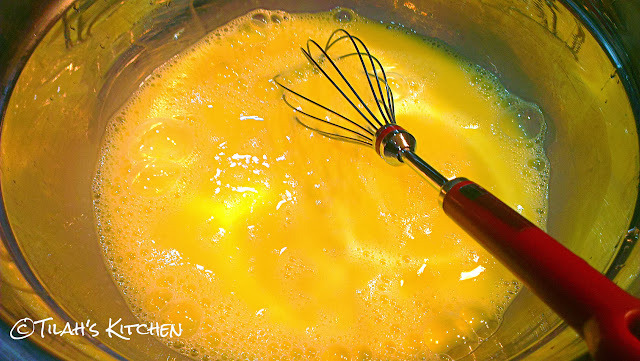 Start pushing the egg mix to the centre starting from the sides with a wooden spoon or heat proof spatula. From the looks of my pan, you would know that this is my last batch and I was lucky that I did get to take a complete picture of this whole process otherwise there would be no scrambled egg post! Sayf can be quite a menace in the mornings! 11. Something like the above pic. 12. 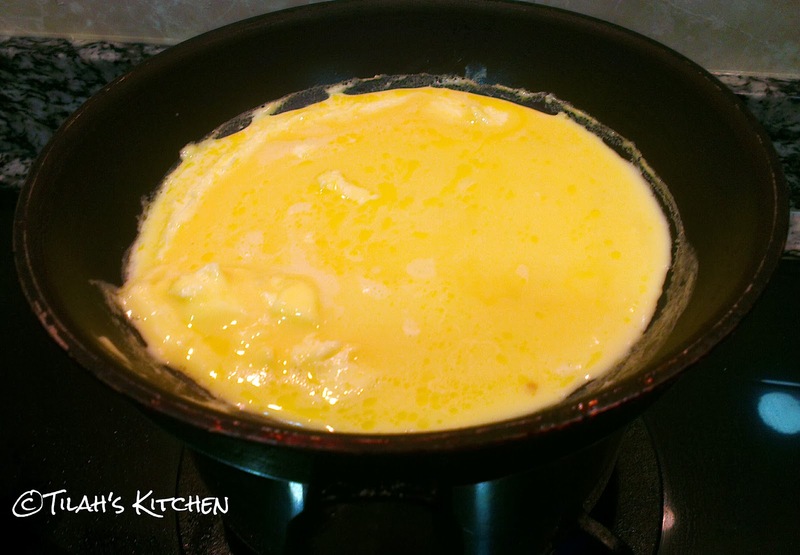 Flip the eggs lightly to make sure that all sides are cooked. 13. 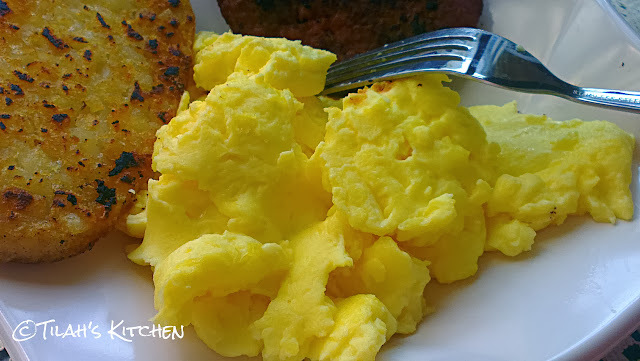 Lift up the pan and serve the scrambled eggs on plate. 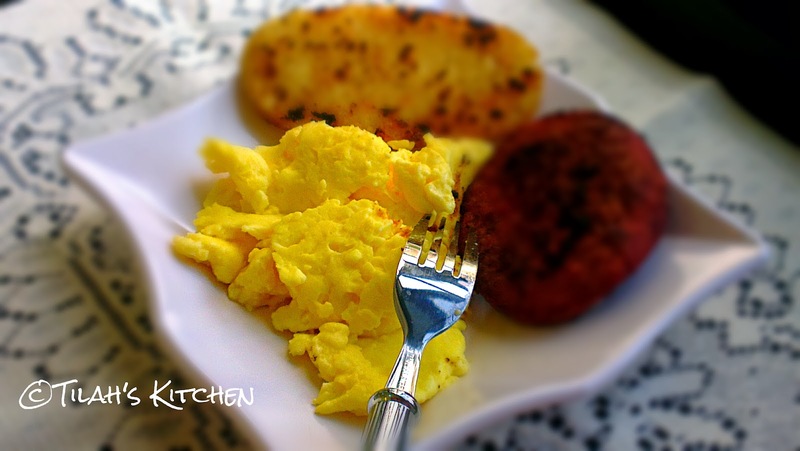 Here's wishing you a very Happy Big Breakfast and Happy Kitchen-ing!